In an effort to help our customers, tech support will be provided from a continuously airborne 747 so we can eliminate time zone challenges. To save money all our new versions will be in black and white. We have now convinced Coffee Fest, World Tea, Pizza Expo, Northwest Food Service, SCAA etc to combine into one super show so all of us in sales are only out of the office once a year. We are going to move our software to be a 100% Facebook application. We all know that is where you spend the bulk of your time anyway right? We have finally created the fastest order system possible – Coffee will have one button that says COFFEE and the restaurant version has one button that says FOOD. Pricing is optional. 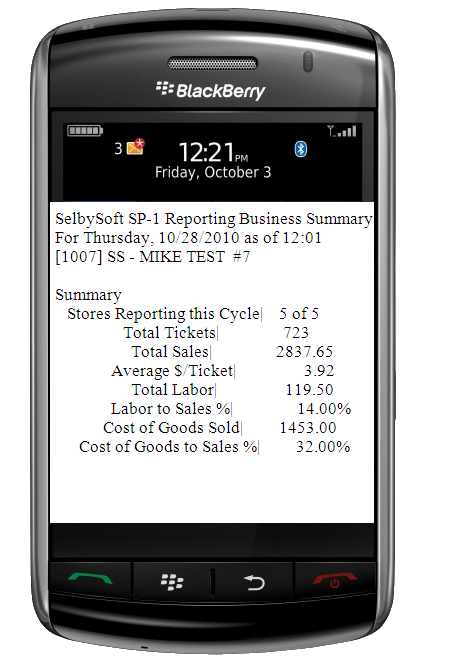 Instead of providing sales numbers, COGS, labor cost etc to your email and phone via MobileDash, SelbySoft will now just send you your employees Twitter & Facebook streams so you really know what is happening in the store. We have contracted with the American Psychic Association to provide tech support so we know about your problem before you do. Our Sales department will be shut down and moved to Taco Del Mar – That’s we all know that is where I spend the bulk of my time anyway. All of these should take place on February 30th 2012. Thinking about our MobileDash Options? You haven’t seen anything yet! This new technology allows SP-1 to remotely communicate with you via email on a constant basis. We then give you menu group breakdowns with totals! This all is emailed to you on an hourly basis so you are completely in control of what is going on in your store. While all of this us pretty cool we decided that it could not stop there. All of this was just the beginning of the reporting you receive from us. MobileDash has been enhanced to provide new features as well! VoidTrack– Ticket voided? You get an email! TheftAlert– If an employee enters 911 as the password for no sale – you get an email alerting you to a potential robbery! AuditTrack – When a void does happen you need to know what is happening. Audit track will show you what was voided who did it and when. TimeManager– an employee clocks in? You get an email! Nosale– No sale occurs? You get an email! Do you use twitter ? How would you you like to tweet specials from SP-1? We have added this feature so that you can tweet specials directly from the system! Don’t think this is the end of this type of development….Keep checking with us for cool options to come! Continuing our introduction to SP-1 reporting. . . The Daily Sales Recap section of SP-1 reporting is where you can access most of the daily business reporting you will need to make intelligent decisions about your business. Balance Till: This area is designed to do just that – allow you to balance a till. This report shows every ticket that was added throughout the day. You can provide an exception on the report for delivery tickets as those are handled through the driver. This report can be run by the shift, the workstation or the day. The best use is to close out the actual cash drawer on a station and to close out a shift. This can help you determine if you are over / short per drawer. Keep in mind that this can also show and reflect credit cards, gift cards, tips, coupons and discounts. This report should be run every day. Workstation Summary: This report is designed to give you a picture of what is happening per workstation – including totals and menu breakdown. Employee Summary: Use this to get a view of how well employees are doing from a cashier standpoint. This report shows the total dollars that an employee sold, number of voids, number of tickets etc. The great thing about this report is that the number of voids gives you a good indication of potential theft. Shift Close – 40 Column: This is very similar to the Balance Till but it is more of a summary. You would use this report to print a receipt (on the thermal printer) for the shift. This allows you to easily close out a till during your different shifts. Business Summary Recap: This is the primary business report and is too large to go in depth with here. This gives you a detailed listing of your day (week, month, year). Labor percentages, menu mix breakdown down to the modifier level etc. The important thing to remember here is that this should be run every day. When this report is run, you have the ability to enter your cash, checks, credit cards etc for the day. This will then compare those entries with what SP-1 has recorded. You can then have an over/short to help see what is happening. Hourly Recap by Week: This report is underused by most stores. Basically this tracks, over a week the total number of tickets by hour and by menu group. This is a great report because it shows you how many orders you had. Use this to help schedule and plan your next week based on the last weeks sales. Credit Card Settlement: This report allows you to reconcile your credit cards that were run through SP-1 with the credit card information reported by your processor. XML Ticket Summary: This is a customized export to an XML format. This report can be brought into Microsoft Excel and used to provide full reporting beyond the normal reporting in SP-1. In my last blog I wrote that we would be looking at what reports SP-1 has to offer. More importantly, we will look at what you should use them for. As I said last time, reports are something that people love and hate. They love the fact that the information is out there and hate the fact that they don’t use it. Let’s try and clear some things up here. . .
Daily Sales – This is the main business reporting section. In here you will find the reports that impact your sales totals and menu mix breakdowns. We will cover this more later. Time Keeping – This is where employee reporting is. Hours, time worked, wages etc. Delivery – Here we cover what happened to the drivers you have on the road. Mailing / E-mail – Marketing is what goes on with these reports. This area is incredibly important as it can help you directly increase your sales and customer retention. Ticket History – Specific, surgical reporting on some certain categories of discounting, comments etc. Account Billing – If you run an accounts payable system for your customers, this is where you will see what is outstanding. Order Processing – If you use our Order Processing module, you will get quote time breakdowns here. Street Names – For those of you that do delivery, you can find out about your delivery area here. Inventory – All of the inventory and portion control reports are handled here. Including the variance reporting on inventory. Deferred Orders – If you handle timed or scheduled ordering, you will find it here. Customer – Specific reporting regarding customers is located here. Now that we have that out of the way, let’s start to talk about these categories in more depth. My next blog will focus on the Daily Sales area. Reporting – What reports should you look at? One of the lessons I’ve learned over the years is that store owners have different ideas about what is important for them. It shouldn’t come as a surprise that this is true – after all, it’s why people open their own businesses. Everyone of these store owners that purchases a POS is to see the reporting capabilities that the system will bring to their store. Once the POS has been up and running for six to twelve months, we see owners starting to dig deeper into the reporting aspect and really looking at the numbers provided. So what “typical” reports should you be looking at? While there is no one answer for all, we do have some suggestions on what might help you understand your business better. In this next series of blogs, I’m going to cover some of these reports more in depth and how they can be useful – both in what they were originally designed for and what they are actually used for. Are you tracking labor cost? After one of the last trade shows, I came away realizing that there are a number of people that don’t use our Employee Time feature. I’m not sure what the thought is here as it is INCREDIBLY easy to track the employee time keeping in SP-1! Once you have employees clocked in SP-1 starts tracking the time for each employee. If you take the time to enter the wage per employee, then SP-1 is also tracking your labor cost! 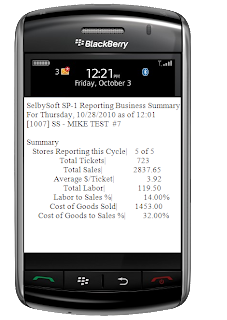 Labor cost is automatically reported on your BSR (Business Summary Recap), Dashboard, as well as being reported on the MobileDash. Having these numbers available to you are very important in controlling your costs on a regular basis.